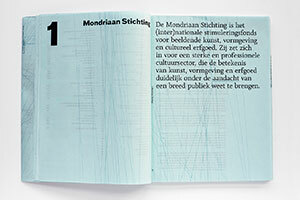 The Mondriaan Foundation supports exceptional projects of visual art, design and cultural heritage of the Netherlands. 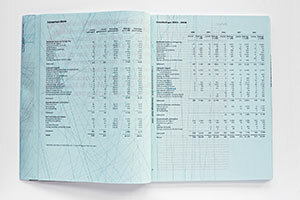 As the organization manages an annual budget of approximately 23 million euros, the annual report is published not only to review the organization’s current activities but also to comply with public accountability and transparency requirements. 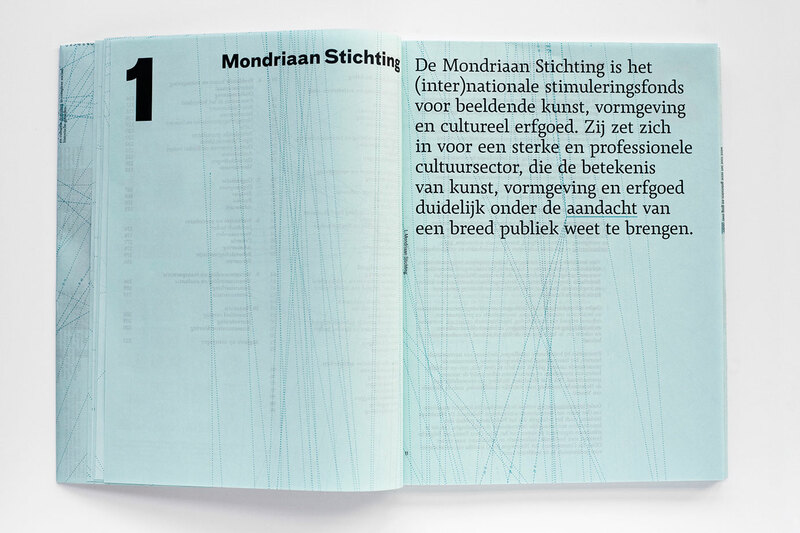 The Mondriaan Foundation maintains strong relationships with a large network of cultural institutions throughout the world in order to stimulate international cooperation and exchange in the field of contemporary art and design. 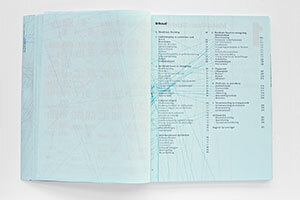 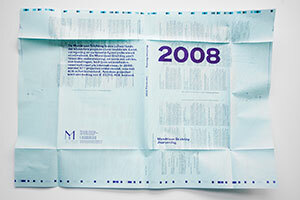 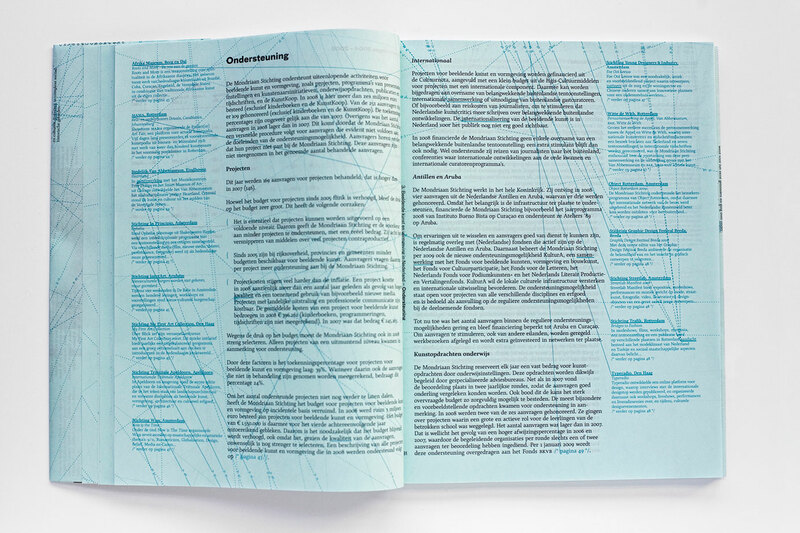 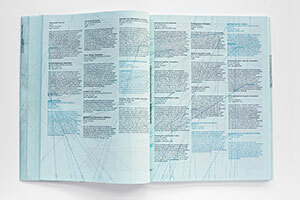 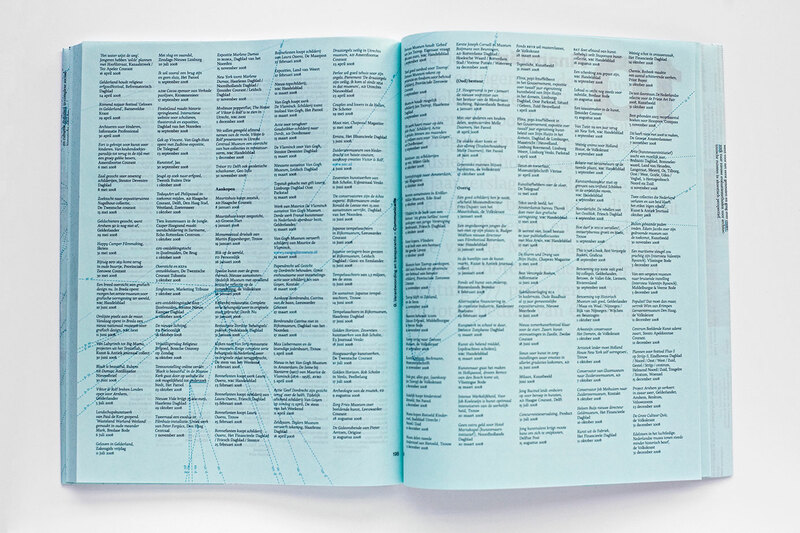 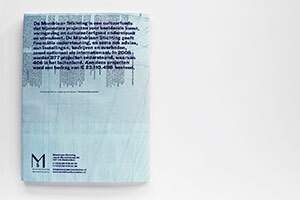 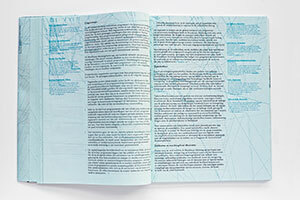 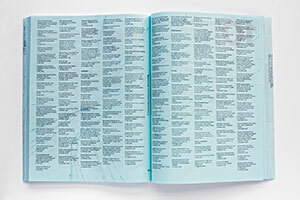 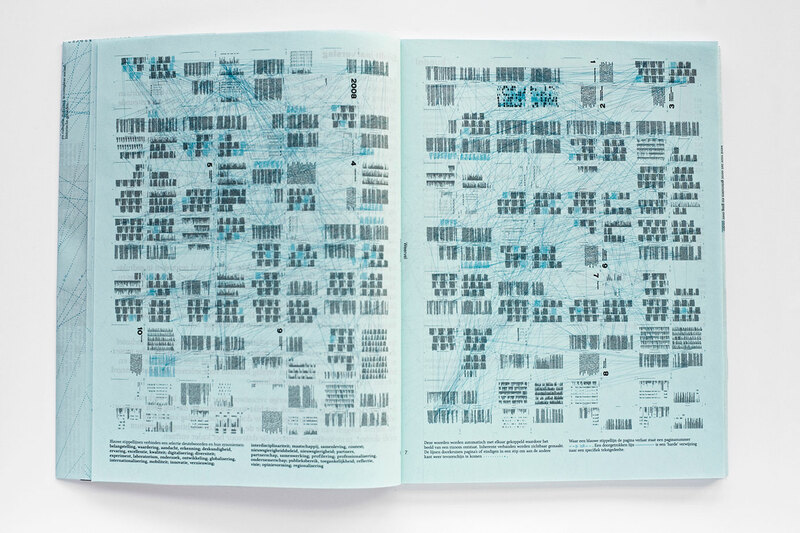 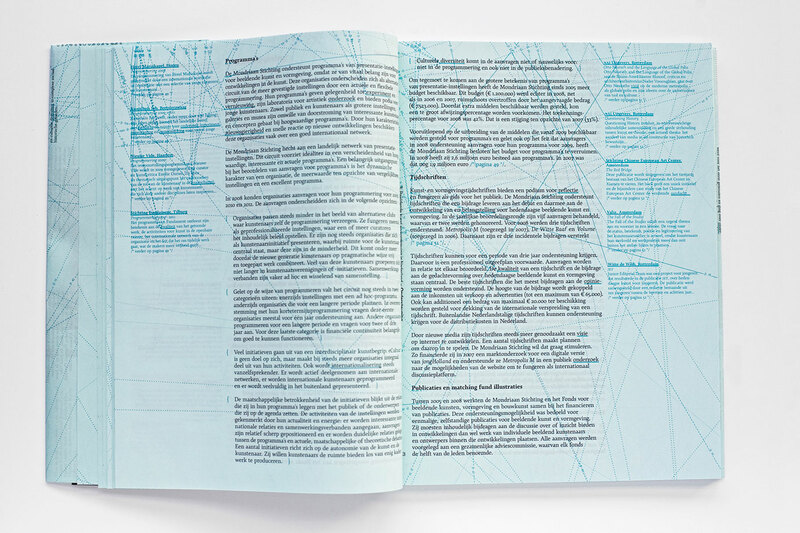 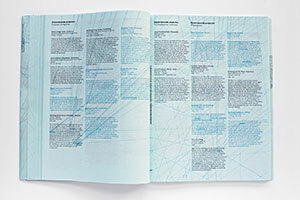 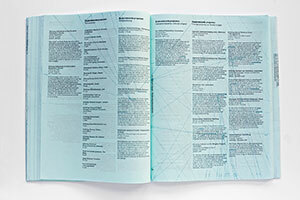 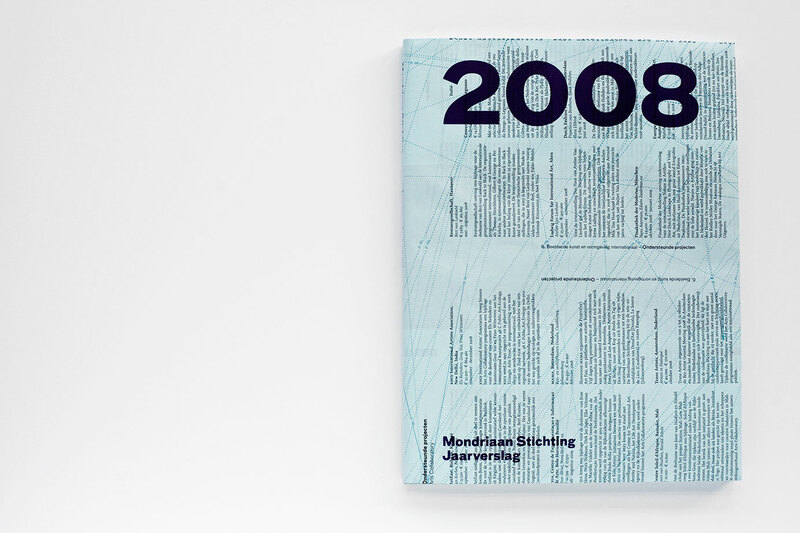 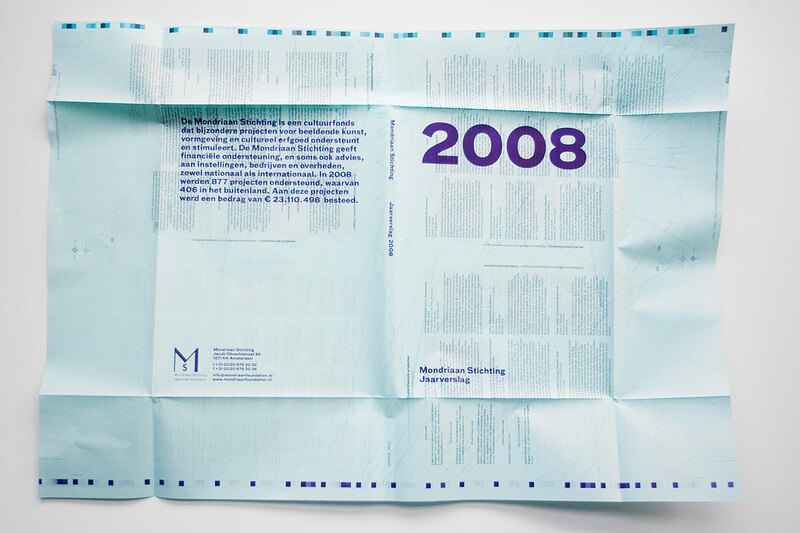 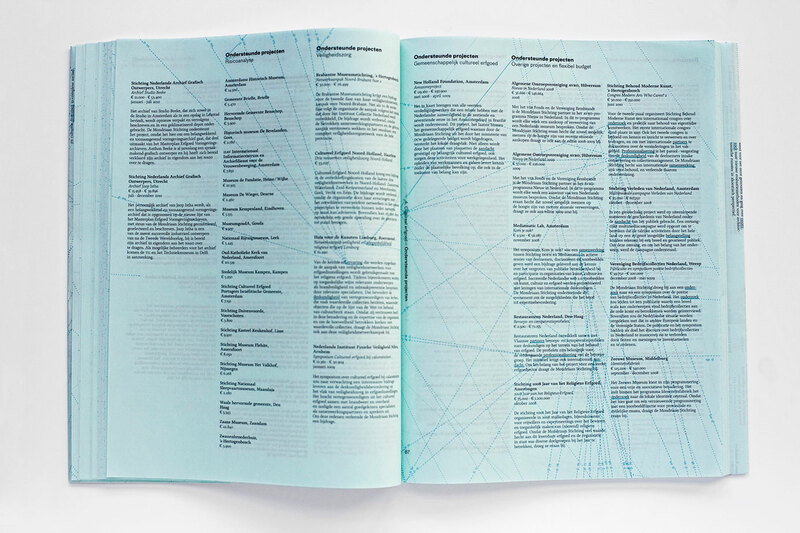 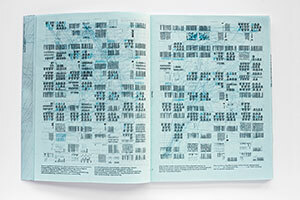 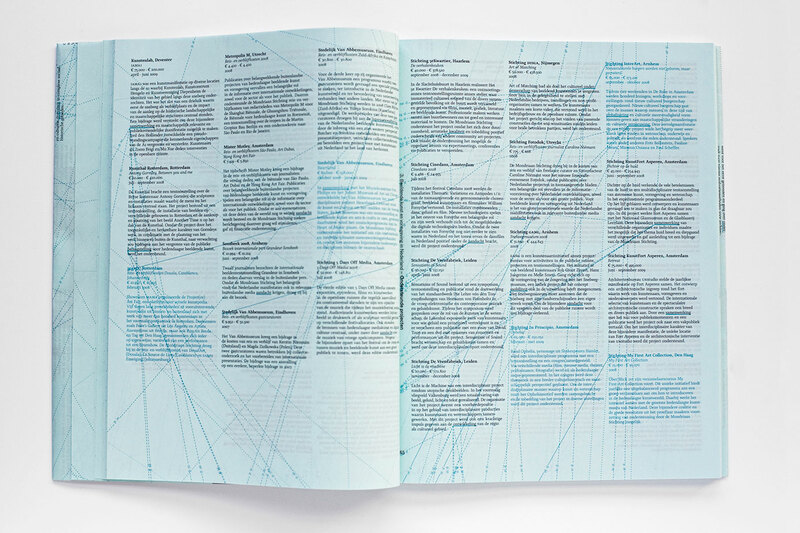 This is why the 2008 annual report aims to reveal the content’s inherent bonds and connections and should be considered as a digital data cloud pressed into the physical embodiment of a book. 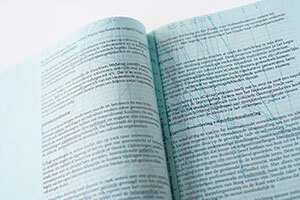 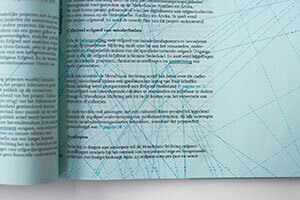 The publication consists of different types of hyperlinks that allow for contextual searching and browsing. 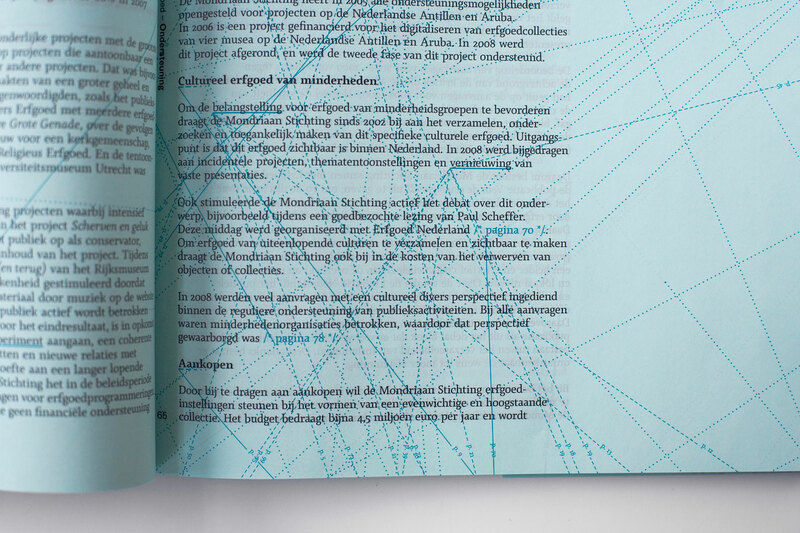 While a dashed line connects related keywords like globalization, internationalization and mobility to a rhizomatic network, editorial links like cross references or footnotes result in a stellar line constellation that points to specific text passages within the book. 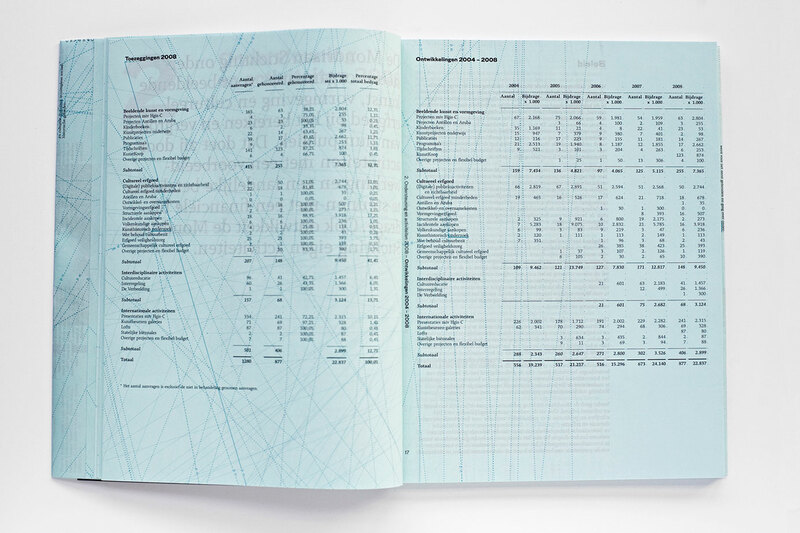 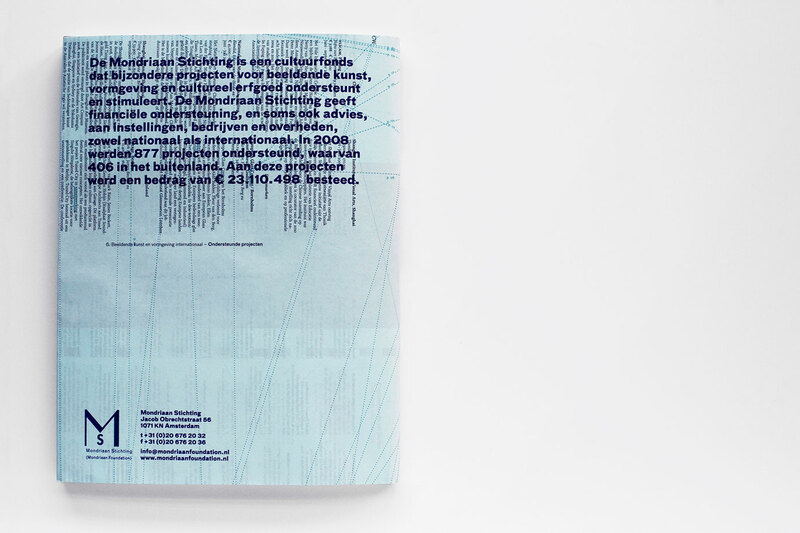 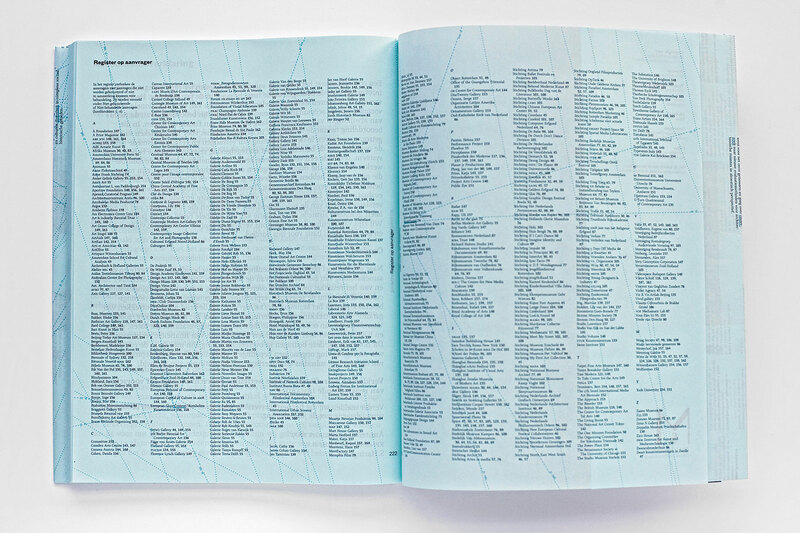 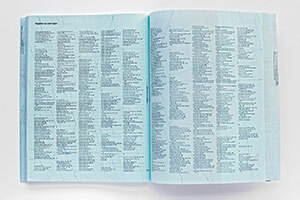 If you follow the page numbers to the corresponding pages you may start reading the annual report non-chronologically and remove the narrative nature of text. 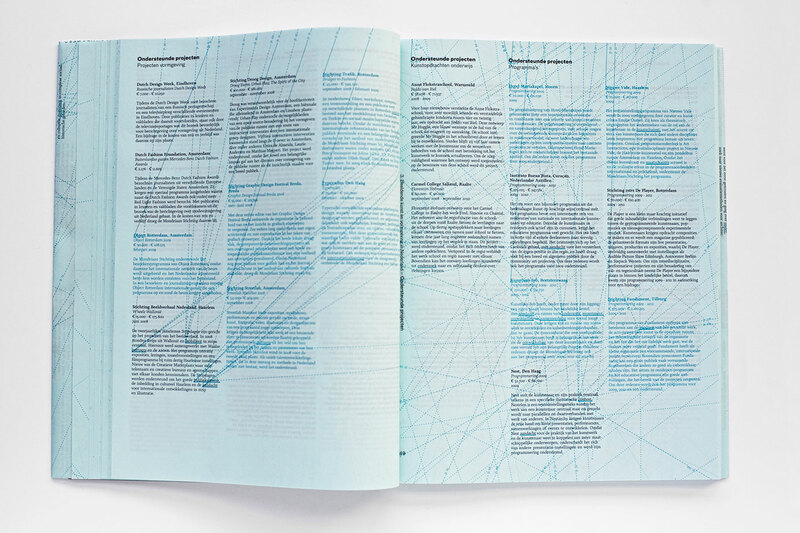 In this sense, the graph-based data display reflects not only the complex relations in the context of cultural funding but uses also semantic connections to reveal the relevant topics that are being discussed within the artistic discourse. 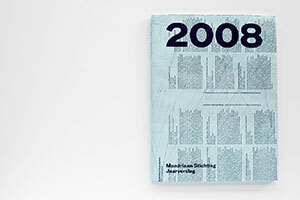 Folio of the annual report used as a dust jacket. 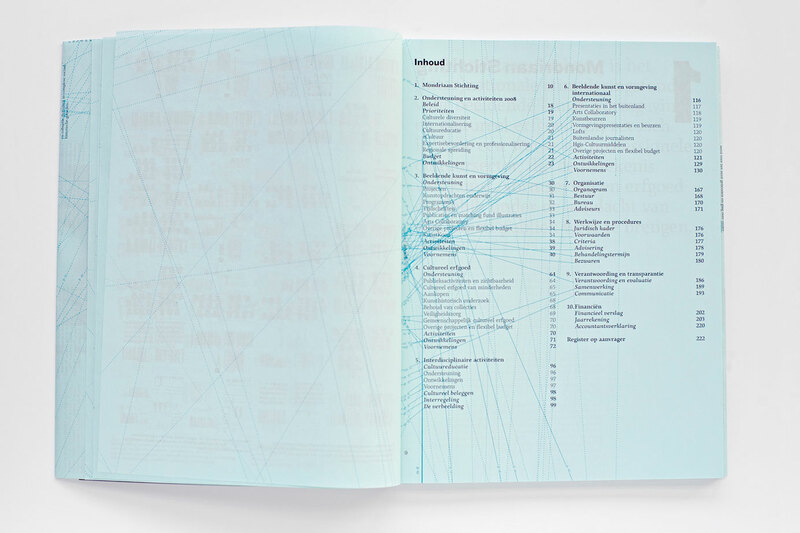 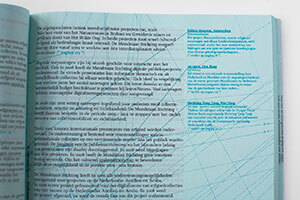 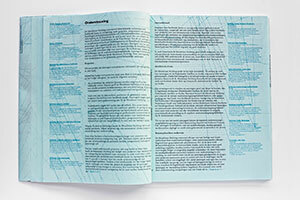 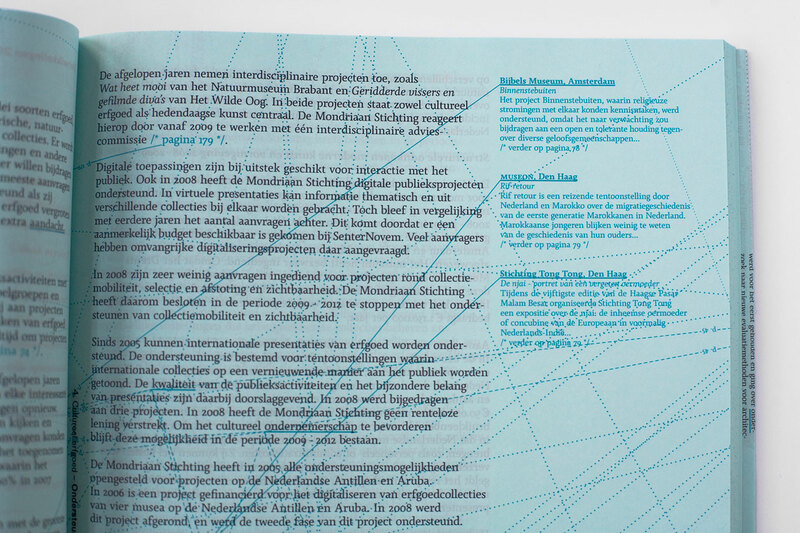 Overview page as a visual metaphor for the Mondriaan Foundation being network hub.